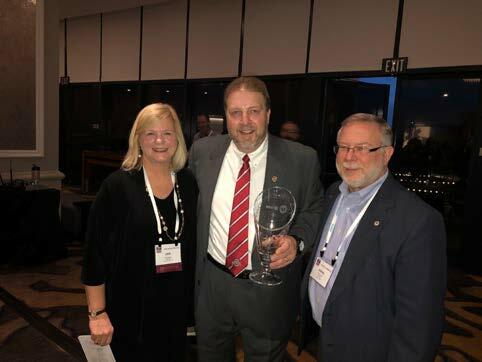 From Left to Right: Debbi Cason, Rob Wagoner and Dennis Rowe, after Wagoner was presented with the Rocco V. Morando Award at the 2018 NAEMSP Annual Meeting in San Diego. COLUMBUS, OH – 3 April 2018 — The National Registry of EMTs (National Registry) announced Rob Wagoner as the recipient of the 2017 Rocco V. Morando Lifetime Achievement Award. The award, presented by the National Association of Emergency Medical Technicians (NAEMT) and sponsored by the National Registry, is a prestigious honor recognizing a lifetime of commitment, contribution and leadership to Emergency Medical Services (EMS). The presentation was made during the NAEMSP Annual Meeting on Jan. 13, 2018. Wagoner has dedicated his entire professional life to the improvement of EMS with many impactful contributions. After beginning his career as a paramedic and EMS educator, he joined the National Registry in 1987 as the advanced level certification coordinator and worked his way up to chief operating officer, where he served until 2017. During his time at the National Registry, Wagoner played an integral role in the development and maturation of safe EMS practices, specifically in the areas of cognitive and psychomotor testing through national certification. As an industry leader, Wagoner has taught educators, state officials, and EMS providers to strive for better patient care, and worked with EMS regulatory systems to ensure that fair standards of care were met. Wagoner has consistently advocated for evidence-based changes for clinical care and supported research that verifies these changes, and his leadership and selfless giving of his time, talent, and expertise has advanced EMS as a profession. Named after the inaugural recipient and founding NAEMT member, Rocco V. Morando, the Lifetime Achievement Award was first presented 30 years ago in Mississippi, honoring significant contributions made by EMS professionals in the forms of advancement, leadership and education. Since its founding in 1970, the National Registry of EMTs (National Registry) has offered the nation assurance that the men and women providing emergency treatment in the out-of-hospital setting are capable of providing the care that patients and their loved ones deserve. As the Nation’s EMS Certification organization, the National Registry provides psychometrically-valid proof of entry-level competence for Nationally Certified EMS personnel through rigorous cognitive and psychomotor examinations. National EMS Certification is offered at four levels and must be maintained biennially by demonstrating continued education and skills competence. To date, the National Registry has certified more than 1.8 million EMS professionals. To learn more about the National Registry please visit www.nremt.org . Formed in 1975 and more than 65,000 members strong, the National Association of Emergency Medical Technicians is the only national association representing the professional interests of all emergency and mobile healthcare practitioners, including emergency medical technicians, advanced emergency medical technicians, emergency medical responders, paramedics, advanced practice paramedics, critical care paramedics, flight paramedics, community paramedics, and mobile integrated healthcare practitioners. NAEMT members work in all sectors of EMS, including government agencies, fire departments, hospital-based ambulance services, private companies, industrial and special operations settings, and in the military.